With formal gardens that tumble down to the beach edge at Ondarreta, the Miramar Palace was once the retreat of Queen Marie Christine Habsburg, the wealthy widow of King Alphonse XII of the Spanish ruling royal family; she was responsible for putting San Sebastian on the map as a popular seaside vacation resort in the late 19th century. 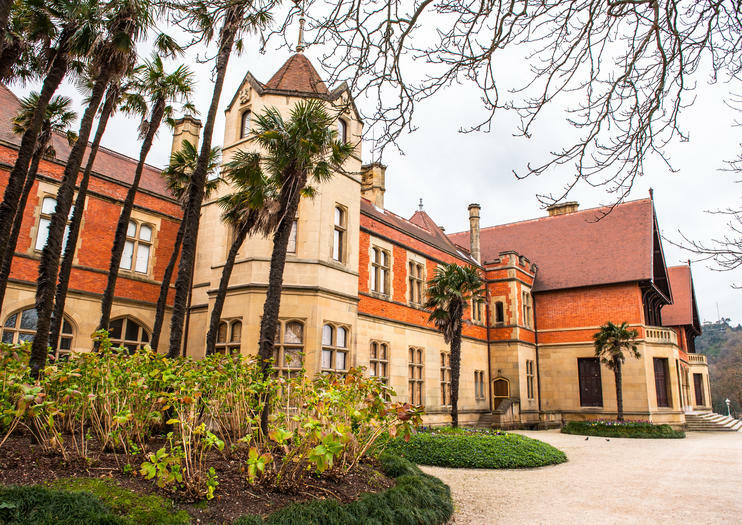 The palace was the work of Basque architect José Goicoa, and was completed in 1893 in the English style. The influence of his design partner, English architect Seldon Wornum, can be seen in the mock-Tudor detailing in the patterned brickwork, gables, tall thin chimneys, and rounded towers. The gardens of Marie Christine’s summer palace are so extensive that a road runs underneath them, connecting San Sebastian’s beaches with the elegant suburb of El Antiguo. After much to-ing and fro-ing between the Spanish royal family and local government officials, the gardens now form an elegant public park, stretching from the former palace to the seafront. It’s a well-loved spot for a picnic on summer days, overlooking the sandy strip of Ondarreta Beach. The gardens of Miramar Palace make up a public park that is open daily. The palace is now a music college and a conference venue, so it is not open to the public. The city’s unique location, rich history – particularly as the royal summer resort of Europe’s elite during the Belle Epoque, its international reputation as a food mecca and unique combination of seaside and metropolitan appeal, and, last but not least the superb quality of life in the city help to make it one of the happiest in the world. And one we love to share with guests and visitors by taking them on fabulous walking tours. Join us on one (or more) of our Donostia / San Sebastian tours, and experience it all – adventure, history, amazing food, local color, exercise, and fun! Enjoy! We'll start at the young neightbourhood of Egia, to shortly after head up to Cristina enea, a hidden gem just 15 minutes of the town centre. Walking along this park we will discover a palace that holds a love story and the peculiar animals that inhabit this park.We'll then cross the river and the city's mainresidential neighbourhood, Amara. There, we'll explore the main aspects of the day to day life of modern basque society, to then head up to Aiete Park, which is one of the biggest parks in town, yet probably one of the most unknown. There, I'll show you immense trees, a hidden cave and a palace where the most loved and hated personalities of these country stayed during their holidays. We'll finally descend to our last park and palace, Miramar, where a spanish queen put San Sebastian on the map during the ‘belle epoque’ for the years to come.Finally, we will arrive at a local bar to sip all the lush green and intriguing history with a well deserved hot or cold drink.